SEGDesign Starter Kit For Easy Fabric Sign Making – DISCOUNTED SPECIAL!! Banner Ups SEGDesign Starter Kit. DISCOUNTED SPECIAL $109.95! More than 20% off! Are you ready to start making fabric signage without the hassle of sewing? The Banner Ups Silicone Edge Graphics Design Starter kit allows anyone to make beautiful fabric signs easily. 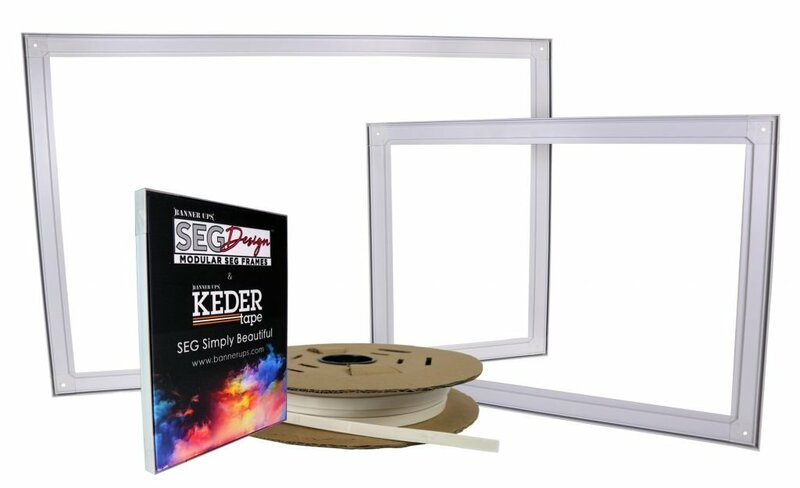 Kit contains: One 18″ x 24″ 15mm frame, one 24″x36″ 15mm frame, one 8″x10″ sample display frame with print, and one 80ft spool of KederTape. SEGDesign frames are a snap to put together, no tools or brackets need. The frames are made from a durable ABS material so you can easily cut to any size. Easy to add color to make your image pop. Can be spray painted with commonly available spray paint. KederTape removes the need for any sewing! KederTape is a high-quality keder that is laminated with a premium pressure sensitive adhesive which allows the product to be “peel and stick” applied to textiles for SEG applications.